Let us ease the frustration of the time-consuming process of getting your heavy equipment to the job site. 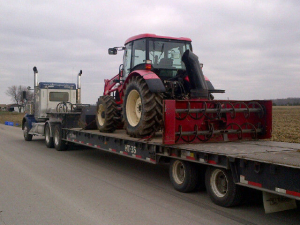 We have several trucks available to ensure that your equipment on time and safely. Our fleet is fully insured, with the ability to accommodate up to ____ tonnes. Safety is our primary objective and as such our crew members are fully trained to ensure the safe, prompt delivery of your equipment. Our fleet is fully ensured so that in the event of an incident, we’ve got you covered.